A magical collection of photographs and stories from the iconic streets of London. Capturing the inspiring, the moving, the surreal and the everyday, Cathy Teesdale has made it her mission to celebrate the extraordinary diversity of life found in London. Presenting over 250 photographs, she introduces us to the real people of London, their hopes, philosophies, troubles and stories. 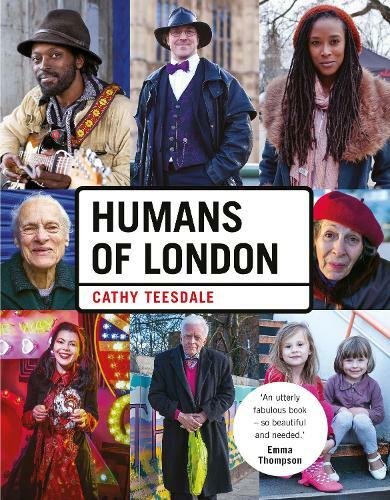 Since beginning the Humans of London Facebook page in late 2013, Cathy has travelled across the whole of the Greater London area, photographing and talking to strangers. This collection of personal encounters is the perfect antidote to feeling lost in a big city. This is a wonderful snapshot of London and the many people who live there. It's hard to know whether the photographs or the stories are more heart-warming. If you love the Humans of New York book then you will love this. The imagery is fantastic and the stories that come with them are lovely too. The fact that the book is based in London makes it even better!